Mr Liu is President of Shenzhen Enterprise Confederation. 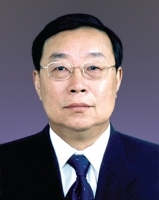 He has served in many administrative posts in the Shenzhen Municipal Government, and has been extensively involved in matters concerning Hong Kong and Shenzhen. Active in public service, Mr Liu has received a number of honours in the Chinese mainland, Hong Kong and overseas, including the Certificate of Commendation to honour the Commander in Chief of the Shenzhen-Hong Kong Western Corridor from the HKSAR Government in 2007.